After your 20% off coupon. 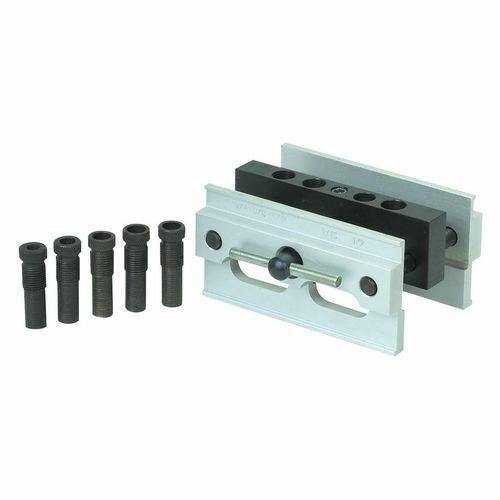 Compare the exact same jig at Woodcraft for $66.50. I bought this jig yesterday after reading the HF reviews, lots of pros and cons, but the bottom line is you need to clean all the cosmolene off of it, take some time calibrating it, and it’s a great doweling jig for very little money. I’m helping a neighbor make a cradle for his grandson, took him to a sawmill for rough cut lumber, milled it to thickness & did glue-ups with him. His plans for this Heritage Cradle call for dowels at all joints, between boards for width and all corners. He purchased this HF jig, and it turned out that it didn’t create the dowel hole exactly in the center of the 3/4” board glue ups, which we discovered by having an approximate sixteenth of an inch misalignment on one panel. I hand planed the one panel this happened to, to make all flat. Investigation showed he somehow put reference marks on both side of one board, which caused the misalignment. The other 6 glue ups went fine because he managed to put all dowel location marks referenced off the show face. I really like mine, as mentioned it was a wee bit off, but it can be adjusted to be centered. By proper shimming it could be made accurate provided the holes are perpendicular and in line. Shims/shimming material can be acquired through McMaster and time spent to do the task. Shimming material costs and so does time. As always in these cases it is a race between the cost of making an inexpensive tool into a good tool and/or buying a tool that is close to being ready to go to work. Of course, even a good tool can need some tweaking. It looks like it could maybe be something worth looking at. Thanks for the post. I think that getting an accurate one is kind of a hit or miss proposition as it is with many of HFs tools. I read all the negative reviews, decided I might be able to get an accurate one even if I needed to do a couple of returns to get it. I got lucky and got an accurate one on the first try. Back when i got one of these, I had to open about 5 of them at the store making several trips and look at the holes to see if they are centered. I found one that was close. since then every time I’m at HF i look at few but have never seen a perfect one. but then again even the quality of expensive brand name one’s has dropped. you can find my reviews on two of those from few years ago. i have one from early 90’s with none changeable bushings that is 100% dead on center even after dropping it accidentally now and then the last two decades. Back when i got one of these, I had to open about 5 of them at the store making several trips and look at the holes to see if they are centered. I found one that was close. since then every time I m at HF i look at few but have never seen a perfect one. but then again even the quality of expensive brand name one s has dropped. you can find my reviews on two of those from few years ago. i have one from early 90 s with none changeable bushings that is 100% dead on center even after dropping it accidentally now and then the last two decades. I keep finding that the “official” stores like Rockler and Woodcraft are selling the very same Chinese product for an immense markup. I even had a Rockler employee admit that the brad point bit sets they sold were the same ones as H F.
I bought one. Wish I had read this before. What adjustments can I make to make it work better? -- Better Late Than Never... But, I'm Getting There! I bought on of these HF “self centering” doweling jigs. 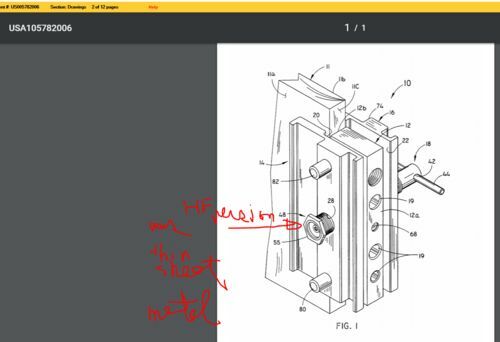 After reading these reviews, I tested the accuracy of the jig before putting it use on my latest project. I was distressed to find that the jig was off by more than an 1/8” on 3/4” plywood (with actual thickness of 0.721” (or 18.38mm). Actual off center was 0.134”. I disassembed the jig but it did not fix the misalignment. 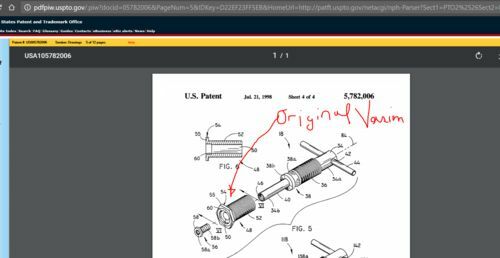 I then looked up the patent for the original invention on the us patent website which had some nice pics which explained the problem. 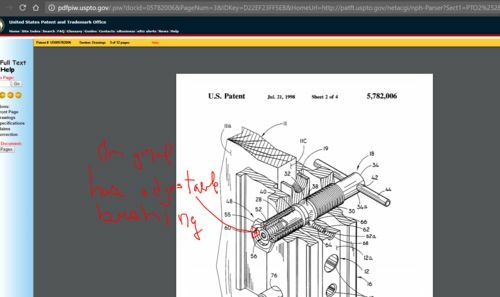 Essentially, the original invention had a two (“2”) piece threaded ram screw. The second piece of the threaded ram screw was originally adjustable so that the jig could be calibrated. This calibration does not appear to be a possibility with the one threaded ram screw. See pics below. I am heading to HF with my digital caliper to see if I can find another jig that was properly adjusted at the factory. 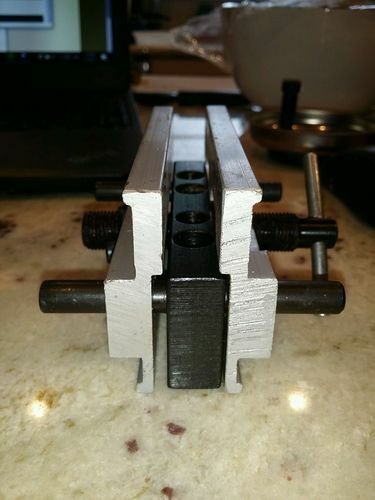 I just got back from Harbor Freight and the “best” self centering doweling jig (among the five that I tested) was off by 0.035”. I need to come up with a better alternative. But, I have not yet figured out what that better alternative will be. I know this is an old thread but….what is the adjustment that can be made to properly calibrate it? ?